JOAN SALVATO WULFF needs no introduction, but I can’t resist pointing out that in 1960 she cast 161 feet with a fly outfit. That’s a whole standard trout line, plus a 9-foot leader, plus like 20 yards—yards—of running line. And she did it with bamboo. That’s crazy. Most good anglers with modern equipment would be pretty pleased to cast half that distance. My guess is that Wulff could cast 80 feet in her sleep and not even remember it in the morning. Which is to say that you’re in good hands here. It has to be said at the outset that it’s not easy to learn to cast from a book. It’s a little like learning to cook a true French omelet from a recipe, without spending any time at the stove. But you have to start somewhere, and for casting, this is the place. For the omelet, consider Escoffier’s Le Guide Culinaire. Teaching fly casting is difficult, too. Casting is, after all, applied physics, and the contemplation of physics gives reasonable people vertigo. But Wulff explains levers, fulcrums, springs, and velocity in non-dizzying terms. There are no formulas; this book will help you cast without your ever having to confront the sheer terror of naked physics. A lifetime of work, study, and practice went into this book. It consists of 32 core chapters. Those chapters cover everything from the principles of the basic cast to tailoring your loops, from trick casts for special situations to casting for distance. And then there’s my favorite, “Getting Out of Trouble.” Before you get your hopes up, no, Wulff doesn’t give tips on how to get out of the speeding ticket you got on your drive to the river; instead, she presents clever ways to unstick your flies from tricky snags. Which is probably more useful, in the long run. Wulff treats casting holistically. She discusses everything from rod-grip-diameter to stance to visual focus to rod drift. This book thoroughly covers casting mechanics and technique, and Wulff also emphasizes the “heart and soul” of fly casting. One example: “If the rod is an instrument, your hand and arm ‘play it,’ bringing it to life (in the way you execute the stroke) to create smoothly beautiful loops.” That makes me want to go out and cast. Pay attention to your grip on the rod. What could be more obvious? But grip is something that’s frequently overlooked. Wulff emphasizes that to get a good power- snap, and thus a strong cast, you need a combination of hand, forearm, and upper arm movement. To do all that, you need to focus on your rod-hand’s thumb and your grip on the cork. “When the grip is right, you can control [your loop] – making it wide or narrow – with ease, and you can feel its creation. You want this!” Most casting manuals take grip a little bit for granted; Wulff most definitely does not. Speed is critical; power is not. “Good casting is more about speed than it is about power, but it is very common for casters to use power instead of speed.” Who among us hasn’t wound up for a mighty cast, really putting the shoulder into it, only to have the cast fizzle and die well short of the target? Mark your lines for distance and weight. I’m always surprised that more anglers don’t put hash marks at, say, 30, 40, and 50 feet on their lines. Perhaps Wulff’s discussion of the topic will inspire more people to do so; it’s an incredibly easy and valuable trick. In addition to chestnuts like these, there are numerous “Troubleshooting” subsections and “Tip” sidebars, and I found these to be hugely helpful. This book is for all fly casters, from day-one beginners to Lefty Kreh-class pros (although I haven’t actually talked to Mr. Kreh about this). It is also a great resource for youngsters and their fishing guardians—there’s a great section on teaching kids to cast, although my guess is that, just like with learning a new language, kiddos need much less instruction than do their elders. I think the key to Wulff’s success as an instructor, beyond her staggering competence, is that she hasn’t lost sight of how she earned her skills; she doesn’t forget where her readers might be coming from or what casting issues they might be struggling with. Years ago she probably faced whatever dilemma you’re currently dealing with, and she fixed it for herself. So she knows why, for example, you have a tailing loop, and she knows how to adjust your technique to correct it. Put differently, she is possessed of empathy, a quality that all great instructors, in any field, tend to share. This is a handbook you’ll return to again and again. Every time you develop a kink in your casting—and I doubt that most of us will ever get all the kinks out—you can consult this book and probably find the solution to what ails you. This is an invaluable resource. 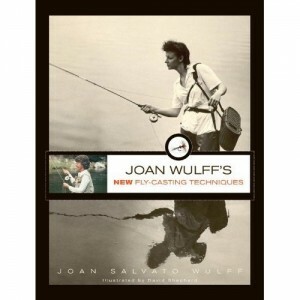 Buy Joan Wulff’s New Fly Casting Techniques in the MidCurrent Store.